Photo credit, page 1: © 2016 Center for Composite Materials, University of Delaware. The CNT-GFRP composite material, which consists of various layers, is being tested in a laboratory setting to evaluate how the material performs in field-like situations. As steel bridges age, accumulating stress from traffic can cause structural fatigue, weakening of solid components such as girders, and degrading of connections that hold bridge elements together. In 2016, 16 percent of the 178,923 steel bridges in the United States were considered in poor condition, according to the Federal Highway Administration (FHWA) National Bridge Inventory. (FHWA 2018) That same year, 18,706 of the Nation’s steel bridges, regardless of condition, were described as “fracture critical”—i.e., they contain tension members whose failure could cause a portion of or the entire bridge to collapse. For these bridges, FHWA requires a hands-on inspection, at intervals not to exceed 24 months, to detect damage such as fatigue cracking. (GPO 2016) When inspectors find damage, bridge engineers use rehabilitation methods such as bolting steel plates to reinforce cracks or restore corroded sections. Engineers also may use strain gauges, accelerometers, and displacement sensors to monitor crack growth as well as the integrity of repairs. Supported by FHWA’s Exploratory Advanced Research (EAR) Program, researchers at the University of Delaware have developed strong glass fiber reinforced plastic (GFRP) composites for the rehabilitation of damaged areas. 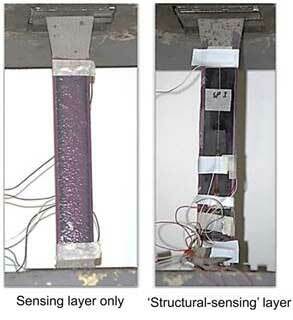 The GFRP patches developed through this project, “Development of Structural Carbon Nanotube-Based Sensing Composites,” also incorporate electrically conductive carbon nanotube (CNT) networks for monitoring postrepair crack growth and, thus, provide an integrated strengthening and monitoring system. University of Delaware researchers developed a composite material that uses a matrix of GFRP and a layer of CNT-based sensors to develop a sandwich of materials that can be applied like a patch, strengthening a bridge while providing real-time monitoring capabilities. Ultimately, the researchers hope the technology will provide bridge owners with quantifiable data that gauge the effectiveness of repairs performed on therehabilitated sections of a steel bridge. During the first phase of the project, the research team developed and refined methods for manufacturing and applying adhesive-backed CNT-GFRP composites to steel and insulating the conductive properties of the CNT network against the substrate. Next, the researchers gauged the composite’s response to realistic environmental conditions on large-scale beam specimens, developing a calibration scheme for real bridges and designing hardware and software components for a field-ready wireless monitoring system that would use this composite technology. 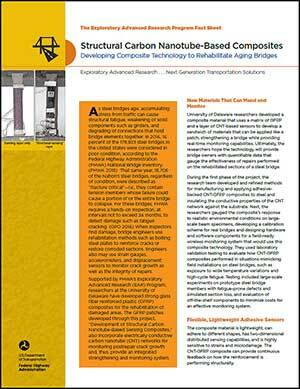 They used laboratory validation testing to evaluate how CNT-GFRP composites performed in situations mimicking field installations on steel bridges, such as exposure to wide temperature variations and high-cycle fatigue. Testing included large-scale experiments on prototype steel bridge members with fatigue-prone defects and simulated section loss, and evaluation of off-the-shelf components to minimize costs for an effective monitoring system.